Best Books Electrical Engineering for SSC JE, RRB JE 2019 Mains & CBT-2. Here I recommended you Best Books For SSC JE, RRB JE 2019 Electrical Engineering Exams. This article provides you Best Books Electrical Engineering for Objective MCQ Questions Both Hindi & English Language. Best Reference Book Books For SSC JE 2019 & Best Reference Book Books For RRB JE 2019.According to the SSC JE 2019 Syllabus For Electrical Engineering & RRB JE 2019 Syllabus For Electrical Engineering in technical portion question will ask topics Basic concepts, Circuit law, Magnetic Circuit, AC Fundamentals, Measurement and Measuring instruments, Electrical Machines, Fractional Kilowatt Motors and single phase induction Motors, Synchronous Machines, Generation, Transmission and Distribution, Estimation and Costing, Utilization and Electrical Energy, Basic Electronics. Here below table provides you best books for RRB JE & SSC JE 2019 for electrical engineering. If you are preparing for RRB CBT-1 see my previous article Best Books for RRB JE 2019 CBT-1 Preparation All Engineering Branch & preparing for SSC JE see my previous article Best Books SSC JE Mains Conventional 2019 Electrical, Mechanical, Civil it will help you for crack CBT-1 or PRE exam. Railway Recruitment Board Junior Electrical Engineer and Staff Selection Commission Junior Electrical Engineer Examination Technical Syllabus for both JE/SSE is almost same. In below I provide you best books subject wise for preparation SSC JE & RRB JE paper-1 and paper-2. Best Books for SSC JE & RRB JE Syllabus Electrical Engineering Topics Basic concepts, Circuit law, Magnetic Circuit, AC Fundamentals, Measurement and Measuring instruments. Below table provides you both Hindi & English Language Best Books. Best Books for SSC JE Syllabus Electrical Engineering Topics Electrical Machines, Fractional Kilowatt Motors and single-phase induction Motors, Synchronous Machines. Below table provides you both Hindi & English Language Best Books. Best Books for SSC JE Syllabus Electrical Engineering Topics Generation, Transmission and Distribution, Estimation and Costing, Utilization and Electrical Energy. Below table provides you both Hindi & English Language Best Books. Best Books for SSC JE Syllabus Electrical Engineering Topics Basic Electronics. Below table provides you both Hindi & English Language Best Books. Objective MCQ Best Books for SSC JE & RRB JE Syllabus Electrical Engineering. Below table provide you best books for objective MCQ question for electrical engineering. These books very helpful for RRB JE CBT-1 & CBT-2 and also useful for SSC JE Pre & Mains for electrical engineering. 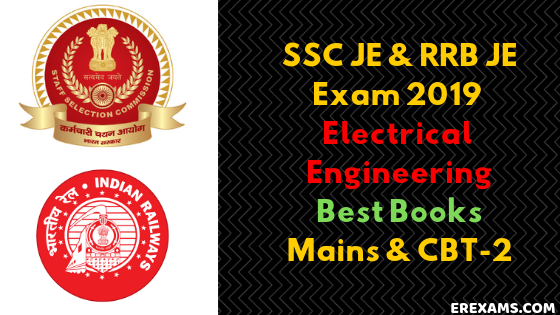 Study Guide Best Books for SSC JE & RRB JE Syllabus Electrical Engineering. These books very helpful for RRB JE CBT-1 & CBT-2 and also useful for SSC JE Pre & Mains for electrical engineering. I hope this post will help you crack your RRB JE CBT-2 & SSC JE PRE & Mains Exams. This article also helpful for all other engineering exams like BSNL, DMRC, LMRC and other junior engineering exams.